Stalling economic growth has made Brazil's government reassess its approach to trade. Currently, Brazil’s trade flows—exports plus imports—average a minimal 25 percent of its GDP—making the country one of the least open amongst G20 countries. As this chart of the week shows, from a chapter by Goés et al. in our book Brazil: Boom, Bust, and the Road to Recovery, we use a heatmap to divide the country into 558 regional groups to illustrate where the most protected industries are concentrated and the degree of trade protection across the country. Trade protection, such as imposing tariffs, helps countries to deter foreign competition and make domestic goods more appealing to domestic consumers. As the heat map shows, over 80 percent of the regional groupings show some level of protection, measured by the effective average tariff of 12 percent or less, while others enjoy a higher level of protection—20 percent or more. The lack of open trade is significant because Brazil’s growth performance has stalled in recent years and trade liberalization—opening up to more trade with other countries—will be critical for revitalizing growth. Indeed, after a long pause, the government is embracing open trade as a key goal. Further, Brazil has requested accession to the Organisation for Economic Co-operation and Development. 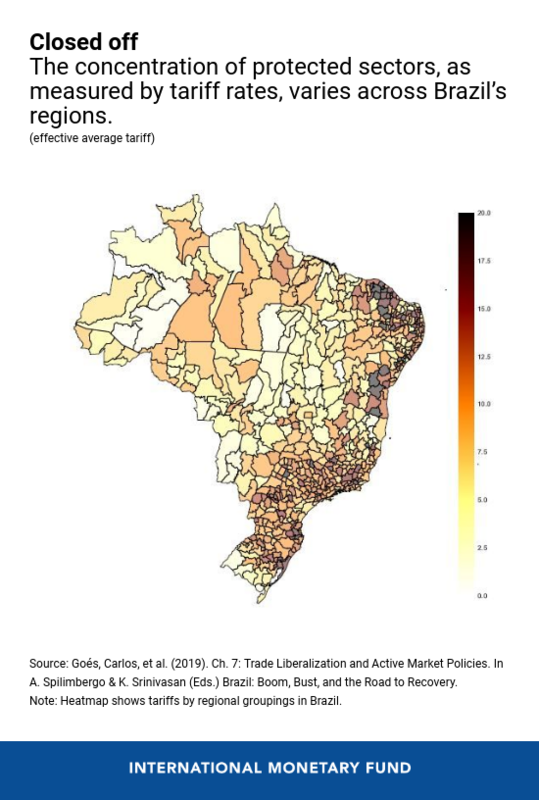 Overall, trade liberalization in Brazil will have a positive economic impact, although some regions will likely lose. This is because open trade affects different regions within a country in different ways. The economic impact depends on where industries are located across the country. For instance, if a region has an industry with a global competitive advantage in producing agricultural goods, such as coffee, it will benefit from more trade with other countries. But a region that benefits from a protected industry—like the car and textile industry—will likely suffer from a more open economy once more open trade allows competitively-priced goods to enter the market. "Trade protection makes domestic goods more appealing to domestic consumers." The country’s labor laws make it challenging for workers to easily change jobs. Given the labor market’s limited mobility as well as the concentration of protected sectors in specific regions, policymakers need to consider these uneven effects and design appropriate measures. Active labor market policies that identify which regions will be most affected by trade opening and the associated regional shocks can help industries better adjust to open trade. These policies should also provide new training that can help workers secure jobs in the more competitive industries. While trade openness is critical in improving growth performance, it will also create local winners and losers. It is important that Brazil has the right economic and labor policies, as well, as appropriate institutions to deal effectively with these shocks.